Drive along a rocky dirt road that leads you past farmlands, village houses and doe eyed cattle, go as far as you can to the end of the road and you’ll discover an unlikely jewel lying in wait. 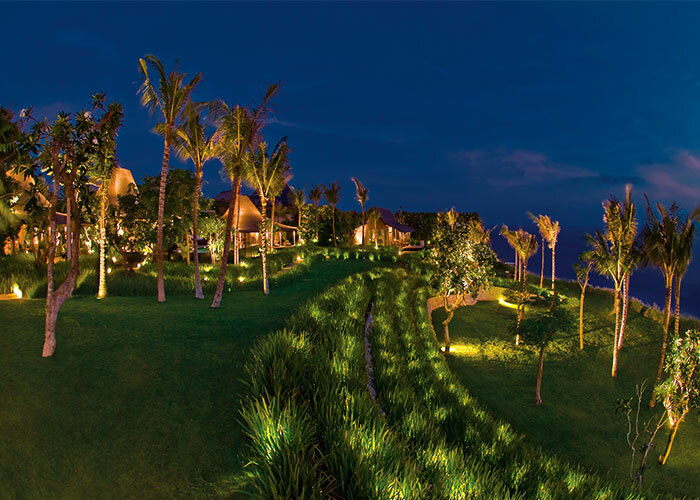 The Khayangan Estate is an oasis in the heart of Bukit Peninsula, in what is known as the Beverly Hills of Bali, where some of the most grand estates – including the nearest neighbour, Bvlgari Resort – lie scattered across the dramatic landscape. Entering through the huge gates and making your way on foot down the meandering driveway, the first thing to strike you, like a divine slap from the heavens itself, is that incredible view! 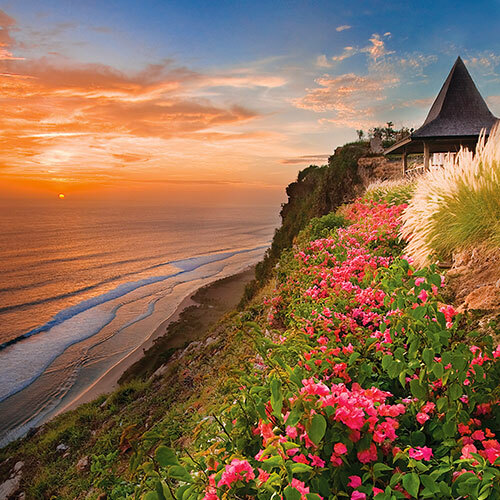 Situated on a rugged clifftop 170 metres above Selonding Beach, The Khayangan Estate enjoys one of the best views in Bali with an 180-degree panorama of the Indian Ocean and the rolling surf below. The founders of Khayangan, Mark and Jasmine Saunder-Davies, undertook a long search to find the ideal location for their dream estate. And when they found this plot, perched high and with its own private white sand beach at the foot of the towering cliffs, they knew that it was here that their dreams would lie. They sought the talents of architect Cheong Yew Kuan, gathered inspiration for the design (Indonesian-born Jasmine is a designer in the couple’s home town of Jakarta), and began building in 2002. It’s been a painstaking yet richly rewarding process to bring the estate to the perfection that it is today – that of a state-of-the-art, six-bedroom villa. 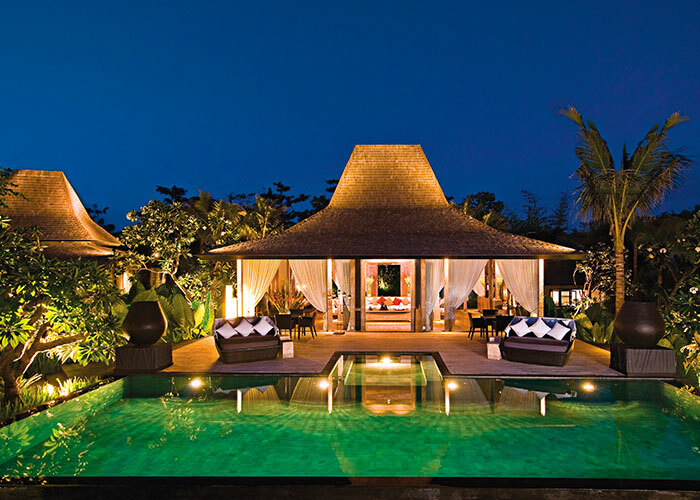 The evocative charm of The Khayangan Estate lies in its unique architecture. 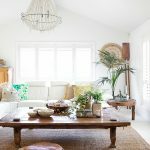 As the passionate people behind the successful Jakarta-based business Old Java, which sells reproduction furniture made from from recycled teak (with a celebrity clientele from all over the world, Mark and Jasmine brought to the table a wealth of experience and an ideal of recycling and reclaiming the past. Khayangan became a place where they could salvage the remains of Indonesia’s rich arts and crafts traditions and share this love with guests from around the world. 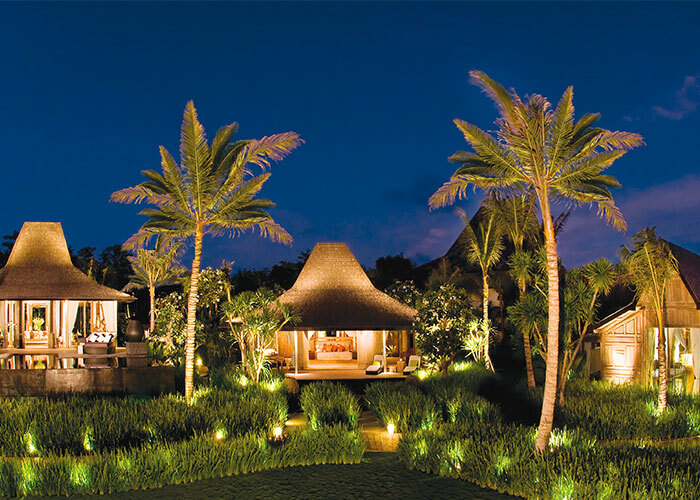 Set amidst a sprawling garden with terraces of yellow irises, swaying palms and fragrant frangipani trees, reminiscent of the traditional villages of ancient Java, The Khayangan Estate features eleven antique Joglos from Kudus in Central Java – once the traditional homes of Javanese aristocracy, some of them centuries old. 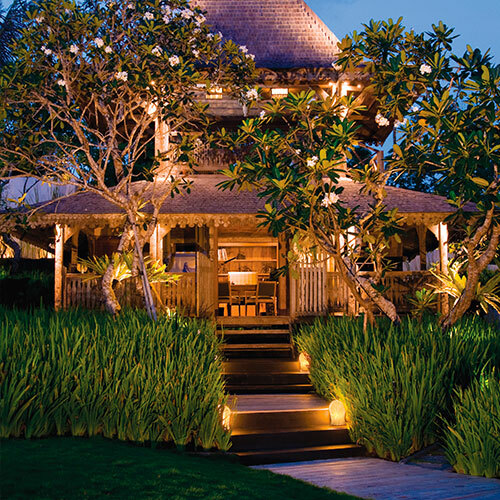 Saved from destruction, they were transported to Bali and carefully restored to preserve their unique character and authentic features, such as the distinctive funnel-shaped roofs and elaborately hand carved ceiling centrepieces, panels and beams. 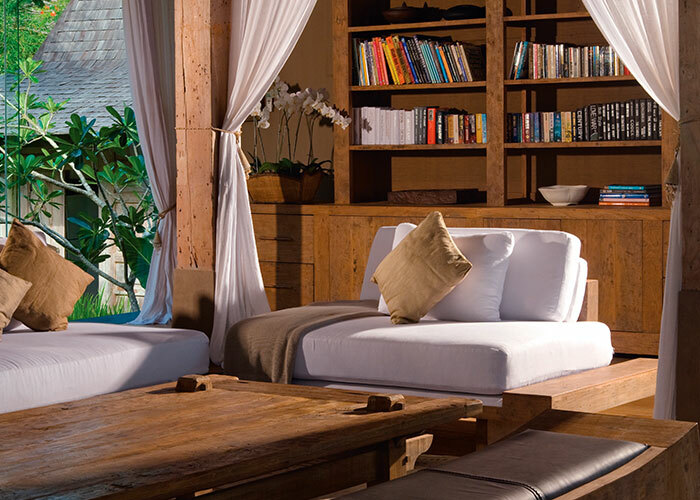 The architecture may speak of a rich history, but the interiors have been designed to complement each Joglos’ new life here in modern Bali, with ultra luxurious contemporary furnishings and decoration, and state of the art entertainment and communication facilities. 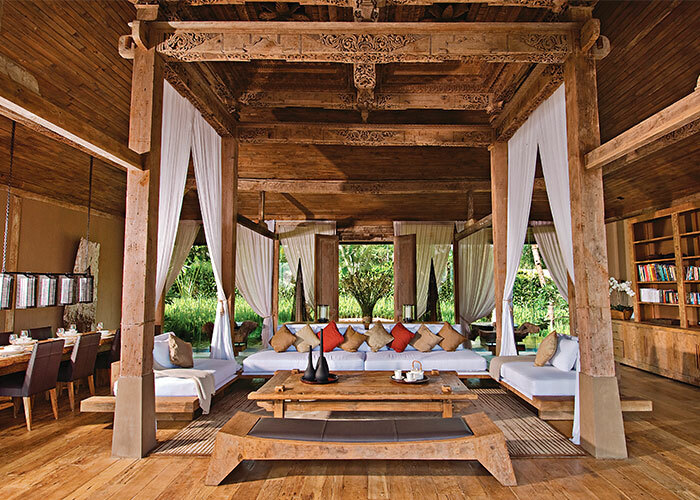 And, in keeping with their Old Java ideals, Mark and Jasmine have ensured full use of reclaimed teak throughout the estate where possible, from the roof and walls, to the flooring and furniture. Though each suite has its own character and style, each has the majestic Khayangan signature king size bed at its heart. 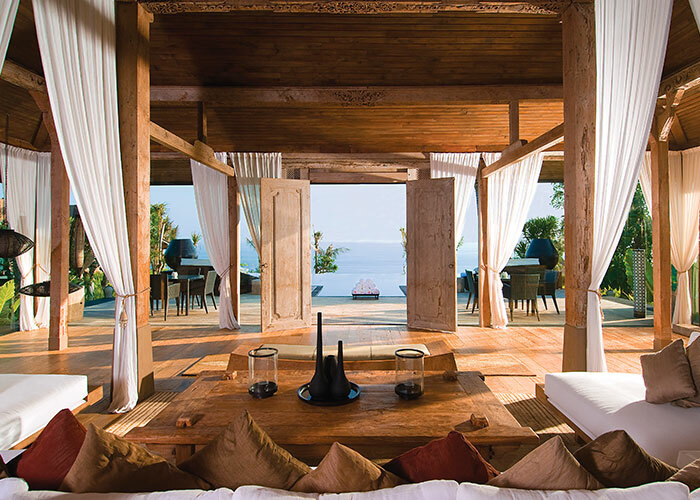 Set within the thick wooden central pillars and under the beautifully and intricately carved pondopo or multi-tiered ceiling centrepiece, you can imagine lying here with the sound of birds outside your door, the smell of the fresh sea air, monkeys scampering across the cliff tops and the lush green of the gardens beyond. This really would feel like heaven on earth – enchanting, evocative and exquisite. 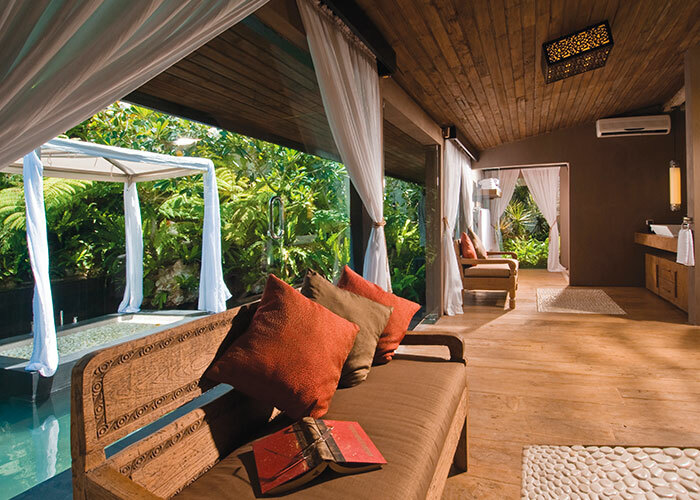 At The Khayangan Estate, the word ‘heaven’ alone does not do it enough justice. 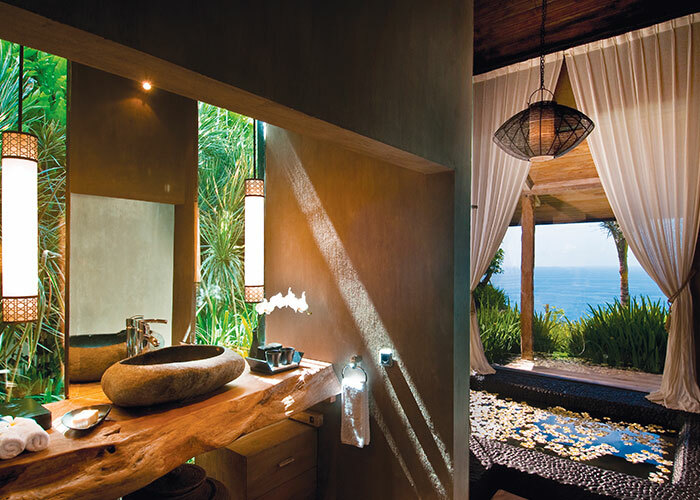 This truly is a place of mesmerising beauty – a Balinese paradise that embodies the glorious history of Indonesian architecture, yet transcends it with an inspiring, modern exotic style.